A different kind of shrimp species having 10.430 g weight, 45 mm carapace width and 130 mm total length was recognized during shrimp catching with deep sea trawl net. It was identified that this species was Pink Glass Shrimp (Pasiphaea multidentata) and there is no record of this specimen in the Gulf of Antalya/ Turkey. Trammel and trawl net are used for shrimp catching in the Gulf of Antalya. Deep sea and shallow water trawls are applied in this region, where many kinds of economically important shrimp species are caught. Generally species of Penaeidae family are caught from shallow water between the depths of 0-90 m. These species are Penaeus semisulcatus, P. kerathurus, P. japoni-cus, Metapenaeus monoceros (Gokoglu & Ozden, 1991, Gokoglu & Kaya 2005). Red Sea immigrant Melicertus hathor has been harvested from shallow waters (0-40 m) of this region since 2005 (Kaya & Gokoglu, 2005). The first record of this species in Mediterranean Sea was reported by Galil (1998) from the coast of Israel. The hab-itat of Melicertus hathor has expanded and the presence in Aegean Sea was declared (Yokes et al. 2007). The other migrant prawn is Farfan-tepenaeus aztecus the depth of 10-90 m in the Gulf of Antalya (Deval et al. 2010). Uneconomi-cal Metapenaeopsis aegyptia is also caught from the Gulf of Antalya with small net size trammel nets and trawl nets. 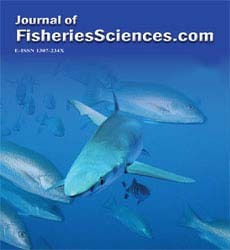 In addition to this species, Yokes and Galil (2006) reported the presence of Metapenaeopsis moigensis consobrina and Tra-chysa lambria palaestinensis in the Gulf of An-talya. Parapenaeus longirostris, Aristomorpha fo-licea, Aristeus antennatus, Plesionika edwardsii, Plesionika martia, Parapandalus narval are caught from deeper waters of the Gulf of Antalya (Kaya & Gökoglu 2005). Parapenaeus longiros-tris is mostly caught from the depths between 60 m and 200 m.
Many researchers such as Polunin et al. (2001), Politou et al. 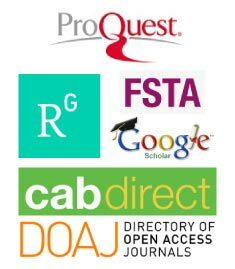 (2005), Ungaro et al. (2005), Fanelli et al. 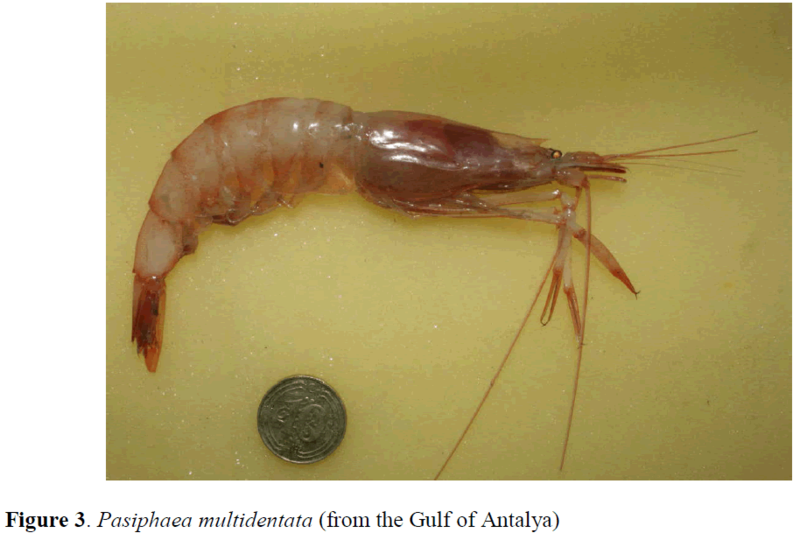 (2007) reported the presence of these shrimp species in deep waters of Medi-terranean Sea. A different kind of shrimp species was caught by deep trawl net between the depths of 400-700 m from the Gulf of Antalya. It was identified that this species was Pink Glass Shrimp (Pasiphaea multidentata) and there is no record of this spec-imen in the Gulf of Antalya/Turkey. This species is a deep-water caridean shirimp living between 200 and 2000 m deep in Mediter-ranean and Atlantic waters (Gonzalez-Gurriaran and Olaso, 1987). P. multidentata undergoes diel vertical migration and predates on gammarids, amphipods and isopods on the bentic boundary layer and is the prey of a variety of decapod crus-taceans and fishes (Cartes 1993). 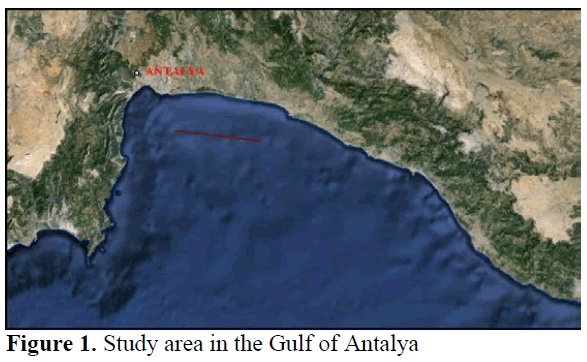 The shrimp was collected off Serik depths of 400-700 m within the framework of a monthly sampling program of the trawling grounds of An-talya Bay. Trawling was carried out in stable weather and sea conditions, by the R/V “Akdeniz Su” at an average speed of 2.6 nautical miles/h [approx. 4.7 Km/h] with a conventional bottom trawl (1100 meshes at mouth opening; cod end in polyethylene, mesh opening 44 mm, equipped with a polyamide cover, mesh opening 22 mm). A different kind of shrimp species was caught on 10.01.2012 in the Gulf of Antalya. Its weight: 10.430 g, carapace length: 45 mm. total length: 130 mm. Rostrum is short, slender, and spinous with wide base and inferior margin concave, ris-ing from dorsal carina of the carapace. Pleura of the second abdominal segment are overlapping those of the first and third segment. There are no chelae on the third legs. Basis of leg 2 has 12 spines and immovable finger. Color of the shrimp is pink and semi-transparent. Telson is narrow and has deeply cleft at apex. There are two cari-nas (spine) on each side of the cephalothorax. The body is laterally compressed (Figure 3 and Figure 4). The coordinates of the first record in the Le-vantine was made 35°59'N 28°14'E by Stephen-sen in 1923 (Galil and Goren 1994). The second record was reported by Galil and Goren (1994). The sample is deposited in Akdeniz Universi-ty, Fisheries faculty museum collection (Crusta-cean ID: 020). 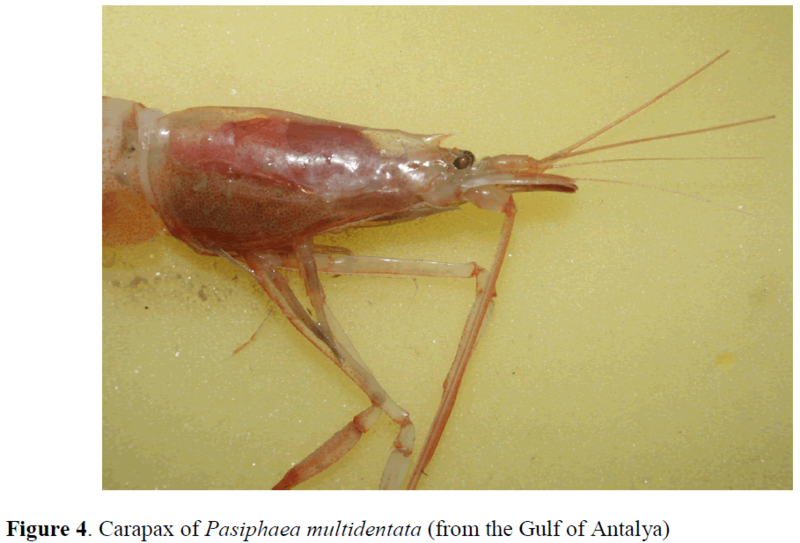 Atlanto-Mediterranean species has been spa-tially bio-diversified increasingly with the reoc-currence of the shrimp, Pasipheae multidentata in the deep sea zone of in the Gulf of Antalya. Cartes J., (1993). Feeding habits of pasipheid shrimps close to the bottom on western Mediterranean slopes, Marine Biology, 117: 459-468. Galil, B.S., (1998). Melicertus hathor (Burkenroad, 1959): A red sea penaeid prawn new to the mediterranean, Crustaceanea, 72(9): 1126-1128. Gökoglu, M., Özden, O., (1991). Antalya Körfezinde Damizlik Karides Avciligi Üzerine Arastirmalar. Su Ürünleri Avlama ve Isleme Teknolojisi Seminer Tebligleri. 119-122. Istanbul Beyoglu Rotary Kulübü, Istanbul. Gokoglu, M., Kaya, Y., (2005). First record of Melicertus hathor (Penaeidae) from the Gulf of Antalya (Mediterranean Sea), JMBA2 - Biodiversity Records. Gonzalez-Gurriaran, E., Olaso, I., (1987). Spatial and temporal changes of decapod crustaceans from the continental shelf of Galicia (NW Spain), Investigaciones Pesqueras, 51: 323-341. Kaya, Y., Gökoglu, M., (2005). Antalya Körfezi’nde Yasayan Ekonomik Karides Türleri ve Yetistiriciligine Uygun Türlerinin Belirlenmesi, Su Ürünleri Mühendisleri Dernegi Dergisi, 4(24): 35-38. Politou, C.Y., Maiorano, P., D’onghia, G., Mytilineou, C., (2005). Deep-water decapod crustacean fauna of the Eastern Ionian Sea, Belgian Journal of Zoology, 135(2): 235-241. Ungaro, N., Marano, C.A., Ceriola, L., Martino, M., (2005). Distribution of demersal crustaceans in the southern Adriatic Sea, Acta Adriatica, 46(1): 27-40. Yokes B., Galil, B.S., (2006). New records of alien decapods (Crustacea) from the Mediterranean coast of Turkey, with a description of a new palaemonid species, Zoosystema, 28(3): 747-755.